Duke of Edinburgh’s Award is a voluntary, non-competitive programme of activities for anyone aged 14 to 24. It gives our students the opportunity to experience new activities and develop skills. Students create their own DofE programme by choosing a physical, skills and volunteering activity and then the other compulsory part is to go on an expedition. 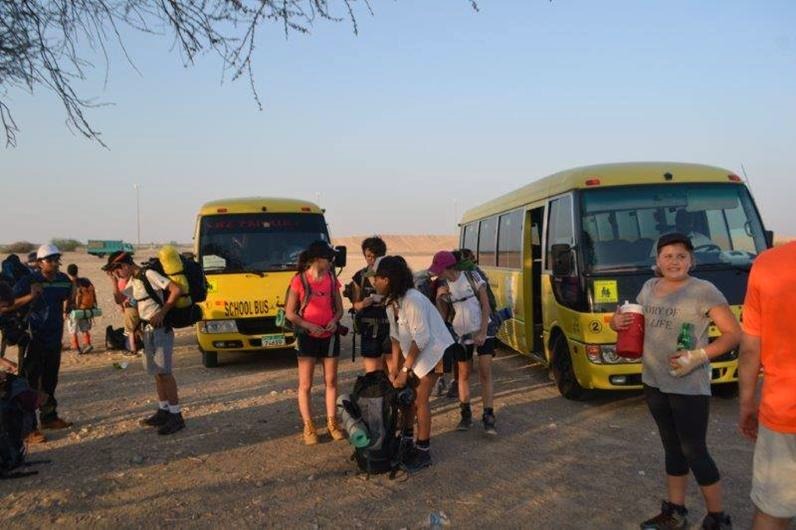 Students receive training in camp craft, equipment and hygiene, food and cooking, first aid and emergency procedures, navigation and route planning. They are also taught how to care for the environment. Team building and leadership skills are developed during the course of the training. Training for the adventurous journey is done on the school premises. During the past few months our students have completed their training sessions which were led by members of primary and secondary staff and our gold participants. We also have a Facebook page, where you can keep up to date with our student’s activities. You can find the page HERE. AAESS was the first school in Al Ain to offer this very prestigious award and course. To get involved, contact Mr Martin Hall: mhall@aaess.sch.ae. 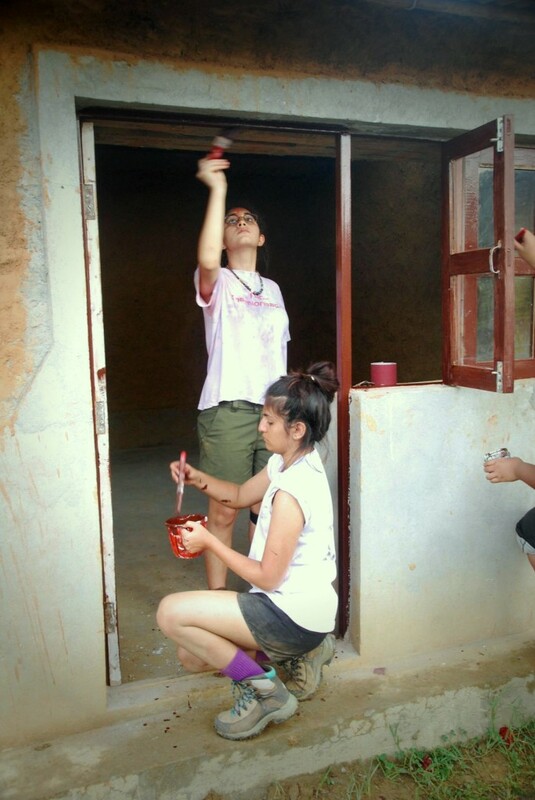 Farah and Iqra painting the guesthouse at the Eco Farm. 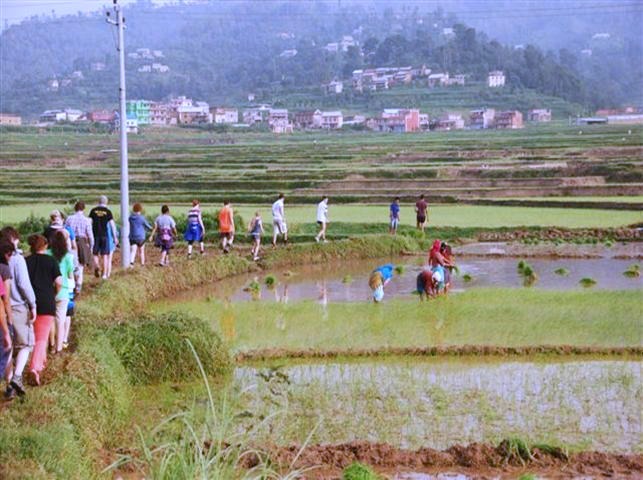 Zoe and the children at Eco Farm in Nepal, overseeing the students who are planting the rice fields. Reading messages to the children, written by AAESS primary school students, and a concert afterwards. Visiting a school where students go to BEFORE school starts in the morning. Students attend this school to get extra classes in the core subjects. Thanks to Ms Jairath for the use of the ICT lab to update our ORBs. We are focusing on completing our skills, services and physical recreational activities. Ms Ralph, now newly-wed and known as Mrs O’Mahony, shared her expertise and we had two afternoon sessions on map work, compass reading skills and bearing etc. This will came in very handy on our assessed journey which was during the weekend of 19 and 20 March 2016. We still needed another two hours of training to ensure that we did not get lost in the desert of Sharjah. No maps are currently available of the area in which the practice session is done, for this reason every team had two GPSs. There would be no maps on this journey. Alex enlightened us on how to use a GPS and program it, the night before we went on our first expedition! What a shock to experience that there was no voice to guide them but only arrows to follow on the GPS. Team 1 set off in the wrong direction and after a kilometre, the staff members decided to chase after them to inform them that they were off course. Staff members are supervisors and it should be done from a distance but an eye is kept on students from different way-points. Alexander Nel, also a gold award participant, showed us how to prepare our food and advised us on which foods were most suitable for our expedition. Mrs. Sheldon held an afternoon in which we planned our menus for our very first Bronze expedition to the foot of Jebel Hafeet. Elrico is also a medic at the AAA rugby club and shared his knowledge with us. (He is currently in South Africa for his 4 year degree in Physiotherapy.) Here we did some simulations. Elrico de Bruyn, currently a gold award participant was our trainer and showed us how to pitch a tent and pack a rucksack.